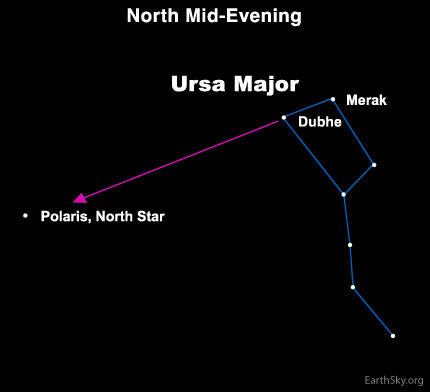 If you can find the Big Dipper in the northern sky in mid to late evening tonight, you can find the North Star, Polaris. The Big Dipper is not a constellation. 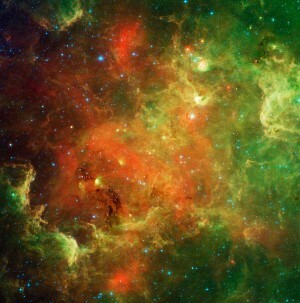 Instead, it is an asterism, just a recognizable pattern of stars on the sky’s dome. It is part of the constellation Ursa Major, the Greater Bear. A well-known trick for finding the North Star, or Polaris, is that the two outermost stars in the bowl of the Big Dipper point to Polaris. Those stars are Dubhe and Merak. They are well known among amateur astronomers as The Pointers. Can’t find the Big Dipper? Yes, you can! It really does look like a dipper, and it is pretty bright. You just have to look for it at a time when it is visible. Moreover, that will be tonight, and for many nights to come over the coming weeks and months in the north in mid-evening. Once you find the Big Dipper, use the pointer stars to find Polaris, the North Star. Site contents copyright © 2019 Recorder Online	except as noted. All rights reserved. | 88 queries in 2.112 seconds.